Stainless steel letters are laser cut in either brushed finish stainless steel or polished stainless steel. Standard grade is 304 (see detail below) or when specifically requested 316 marine grade (see below). Marine grade is used for cut out lettering on boats and on properties close to the sea. 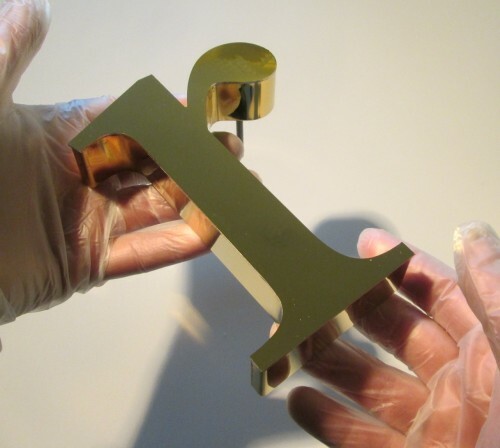 Stainless steel letters are supplied with either brass locator fixings(see below) or threaded rods. 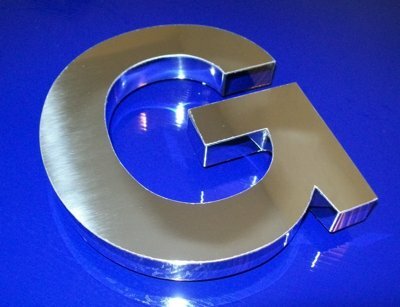 How to order stainless steel letters from Arro Signs. To get a quote from us either contact us by telephone on 01202 546540 or email us with your requirements. The information required to give you a quote. We need to know the height of the lettering required. The name of the font typestyle. 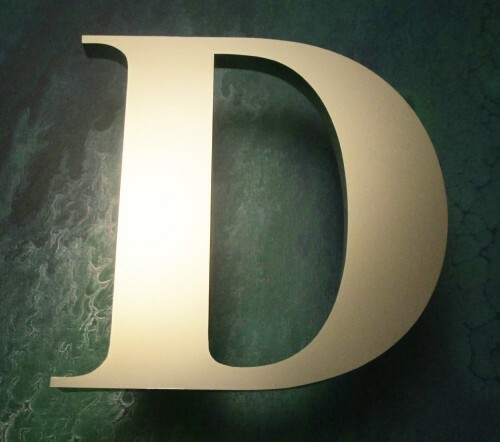 The finish required on the letters, either polished, brushed or painted. Is the lettering required as flat cut lettering or built up lettering, flat cut letters are letters cut from a 2mm or 3mm thick material, built up letters are made by soldering a letter together with a face and sides, like making a box, the thickness of built ups is determined by the height, usually 10% of the height, therefore a 200mm high letter will have a 20mm return. Do the letters require rod fixings on the back or brass locators. Rod fixings or brass locators are used for fitting onto stone, brick or concrete, brass locators are used for fitting onto wood. Are the letters going to be fitted near the sea, if so 316 grade will be required, otherwise 304 grade is used as the standard. With the above information sent to us, we will give you a quote. once the price is agreed we will require payment by credit card or PayPal. Delivery times vary depending on how busy the workshop is. As a guide, Flat cut lettering takes about one week, while built up letters take two weeks. Larger orders may take longer. Short lead times are possible on occasions when there is a tight deadline on a job, so please ask. 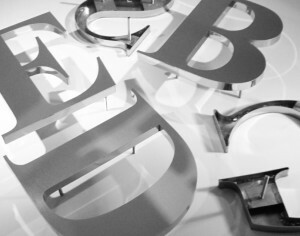 Stainless steel metal letters are cut to order so can be supplied in any practical font/type style. They can be in a traditional font such as Times Roman or in a contemporary font giving a modern look. Brass hexagon locator nuts come as male and female parts, for the concealed fixing of signs, panels, fascias, and lettering. One part of the fixing is welded to the back of the letter and the other is fixed to the wall/fascia – go to this link for a video which demonstrates how these fixing work. These fixings also permit the removal of signs for maintenance or servicing. Locators are available in brass or nickel plated brass for superior strength and longevity. This fixing automatically raises the letters approx 10/15mm away from the wall/fascia. Where the cut-out metal letters are fixed flush to a fascia panel or if they are too small for metal fixings then VHB tape is used. Used in marine environments or in areas close to the sea – grade 316 is an austenitic stainless. Corrosion resistance for 316 stainless can be improved by adding two or three percent molybdenum, 18 percent chromium and 10 percent nickel. Grade 316 is similar in strength to 304. Grade 316L is a variant of 316, with traits similar to 304L stainless. It is also one of several austenitic grades, metals are known for their strength, easy workability and weldness. Austenitic stainless steels contain between 17 to 25 percent chromium and 8 to 20 percent nickel, making them highly resistant to oxidation and corrosion. 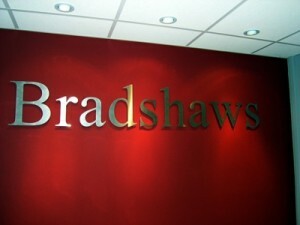 For Advice and a price email: sales@arro-signs.co.uk or telephone 01202 546540. 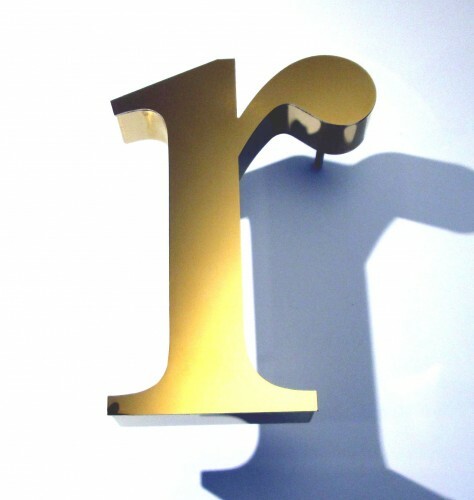 We also supply gold coloured stainless steel letters in a brushed finish. 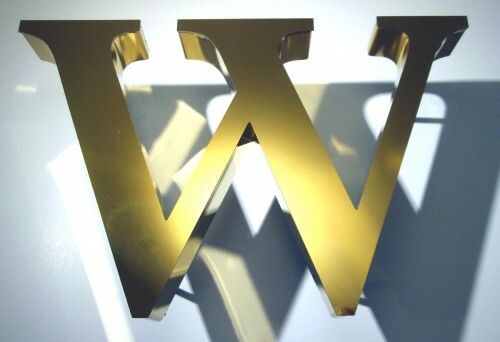 Titanium plated gold coloured stainless steel. 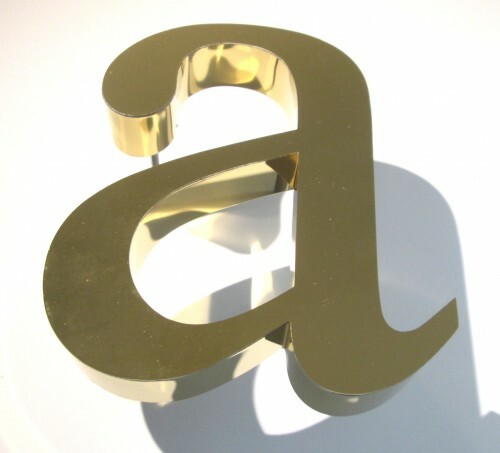 Letters are available in either polished or brushed finish. 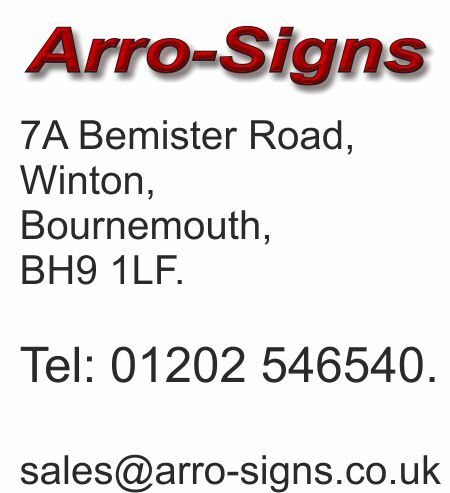 Arro Signs. 7A Bemister Road, Winton, Bournemouth, Dorset. BH9 1LF. Tel: 01202 546540.